David Yates begins a very impressive run on the Potter series with Order of the Phoenix by taking a massive, difficult of the books, paring it way down, and honing in on its themes of teenage angst, discontent, and disconnect. He’s not completely successful; the movie does suffer trying to compress so much into so little time, the pace is so hurried that it’s rarely given any time at all to breathe, and some points that should resonate more, make more of an impact, don’t hit as well as they could because the movie’s so clearly worried about slowing down, because it’s making good time here! What’s great about Order of the Phoenix far outweighs what’s not so great about it, though. That starts with, again, zeroing in on the most crucial aspect: Harry’s intense frustration of where he stands, with being left in the dark by the people he trusts and who ostensibly trust him, at a time when he’s oppressed by fear and uncertainty anyway. And that’s done very well; Harry’s deeply empathetic here, even when he’s snapping at Ron or choosing not to let Ron and Hermione in on what he’s going through. Even if I don’t have experiences that particularly relate to these, Harry’s arc in OotP the book is one of the things that’s kept that my favorite of the books – it’s just so very real, and the film does a fine job of capturing it. Goblet of Fire was a lavish action-adventure-thriller, Order of the Phoenix is practically a character study; that was the largest in scale so far, this is the smallest. I’d hate to use the word “gritty,” but that is obviously what Yates is aiming at: a rougher, more down-to-earth tone and shooting style. It’s not subtle, but it’s effective enough. He’ll get better at it, too. -I feel like it doesn’t come across enough how much Harry and Sirius are in the same boat. We hear, by way of Harry’s letter, that Sirius would know exactly how alone he feels, but we don’t really see it. -Grawp serves two purposes: (1) to give Robbie Coltrane/Hagrid more than one scene, and (2) to play with Umbridge like a toy in her final scene. That’s not enough reason for him to be in the movie, though; he’s a waste of screentime the same way he was a waste of page time. -I love Sirius’ death scene – well, perhaps that’s the wrong way to put it; I think it’s very powerful. But I’m left wanting more for the scenes after it, or at least for the one between Harry and Dumbledore. I don’t know exactly what I’d suggest, but it’s underwritten. I miss Harry finding the mirror Sirius gave him, then realizing that even magic can’t allow him to communicate with his godfather. Sirius is gone and he’s not coming back (well…). I wish that had made it, not really because it sets up the mirror’s reappearance in Deathly Hallows, but because it’s as tearjerking a moment as it is. -On the one hand, I’m okay with the way the prophecy was dealt with in this film. We don’t need to know the full story of Dumbledore’s first meeting with Trelawney, we don’t need to know about the Death Eater who overheard part of it (yet). All that matters is that Voldemort knew there was a prophecy that someone would rise up with powers he doesn’t have, and that he went after him. On the other hand, I wish the final scene between Harry and Dumbledore was longer and better, in part to say that it was Trelawney, because I’m not sure it’s recognizable unless you already knew. It’s interesting that one line is removed from it, “Either must die by the hands of the other” (or something like that). For the longest time, I wondered why, but I suppose it’s because if you take out that one line, Harry can infer it and decide that that’s how it has to be. -I know the St. Mungo’s scene is one that’s widely missed, but I like the way the film handles it. I like the intimacy of Neville simply confiding in Harry that he has his own horrors, his family has its own cruel losses. -Again, no house-elves, and again, I don’t mind. It feels a lot less convenient, a lot less like a bit of deus ex machina, for Neville to stumble across the Room of Requirement than for Dobby to tell them about it. The films keep giving Neville more moments to shine; I have to say, I prefer Movie Neville over Book Neville. As with last time, however, cutting Dobby out has repercussions. Overall, Michael Goldenberg did an admirable job turning the most demanding book to that point into a strong screenplay. Once again, exponential improvement, this time equally across the board. Of course, Dan has the weight of this film on his shoulders – yes, that’s true of all of them but it’s a different set of challenges in OotP – and he’s incredible. Just outstanding: commanding, subtle, intense, heartfelt, touching, inspirational, deeply empathetic. He holds his own with some of the best actors around. Ron and Hermione are…not sidelined, but the trio aren’t the strong unit they were before, and will be again, for much of this one. Ron and Hermione are in a bad position themselves at the start, with Dumbledore of all people telling them not to let Harry in on things. It’s not something Harry could possibly understand, but when they want to know what he’s going through, he shuts them out in return. That’s all very relatable and very well-acted stuff. Rupert and Emma give such mature, well-rounded performances, and it’s affecting to see the trio essentially reunite as the movie wears on, with Ron and Hermione not just standing by him in a great way but spurring him on to be the leader they need when Umbridge fails them. Imelda Staunton is genius as Umbridge, with that grating girlish giggle and absurdly perky demeanor covering up the cruel, hateful woman underneath. All that matters to Umbridge is upholding the Ministry status quo, and if you should step a toe out of line, God help you. Staunton’s mesmerizing, fantastically embodying everything Umbridge is: every sycophantic need, every vicious instinct, that whole sickly-sweet façade. Building on his post-Shrieking Shack scenes in Prisoner of Azkaban – and his one scene in Goblet of Fire – Gary Oldman is hugely sympathetic as Sirius. Sirius never recovered from losing his best friend and basically brother – he never got the chance to – and now here it is happening again, the same war with the same enemy, and if Harry feels alone, Sirius can show him what that really means, because he really cannot rejoin society. The outside world decided he’s the bad guy and they seem to be sticking with that story. Harry and Sirius, Daniel Radcliffe and Gary Oldman, may not get all that much time together, but the bond they share is present in a big way. Their interactions are truly touching. Sirius’ death is a crushing blow, and his death scene itself is tough to watch, which it should be. Besides all of this, Sirius is just cool, especially when he’s played by Gary Oldman. Fiennes' Voldemort is not as brutal or terrifying in OotP as GoF, but I think that's because he doesn't have the same opportunity to cut as deep this time. 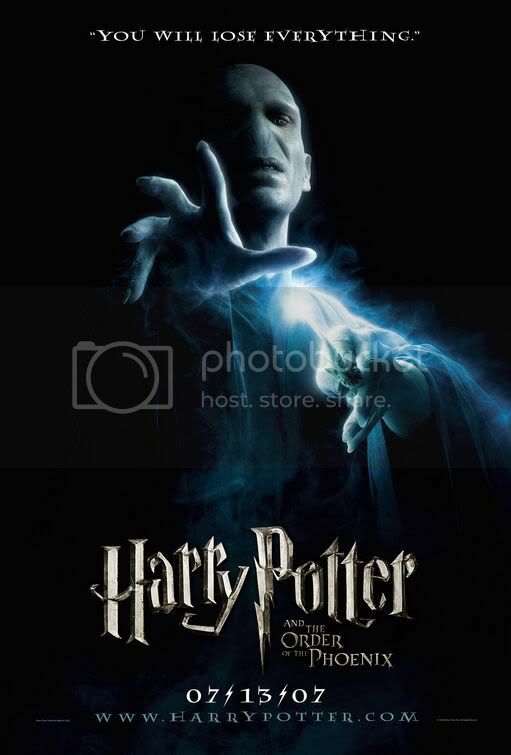 Voldemort's most horrifying moment actually doesn't even feature Ralph Fiennes. He's completely compelling, still, and the showdown between him and Michael Gambon's Dumbledore is something awesome to behold. David Yates has a much, much better understanding of who Dumbledore is than Mike Newell - but the needs of this particular story mean that Dumbledore is still not the Dumbledore we grew to know and love. This time, Dumbledore has to be cold and a bit gruff; he's shutting Harry out because he believes it's for the best, and on top of that, he's trying to decipher what precisely is going on with Harry and what's connecting him to Voldemort, he's gradually losing control of his school. We know that Gambon can do this well, and he does. He also, kind of surprisingly, has a number of charming moments of humor - like the ever-polite bow of the head when Umbridge acknowledges what each Headmaster has brought to Hogwarts, or, the sarcastic-yet-not-rude "Clearly" when Umbridge and Fudge confront him with Dumbledore's Army. It's a problem that I don't believe Dumbledore as much as I should when he tells Harry, "I care about you too much," but Gambon's good this time. He doesn't feel like Dumbledore, but in this case, that's actually the point. is there anything to say other than, "Perfect?" I can't imagine that there could possibly be anyone who could conceivably come close to Evanna Lynch's Luna. She's funny, charming, sweet, sincere, strong, pleasantly odd, and anything else you could say to describe Luna. And she's a true Fan, which isn't essential, but it helps. Delightful. Helena Bonham Carter seizes this character, holds on for dear life, and takes full advantage of the potential Bellatrix gives her to be unabashedly, hilariously, deliciously evil. She's an out-and-out sadist, and gets a twisted, childish glee out of the pain she inflicts on others, and it's both fun and troubling to watch. I love the vibe of decayed sexiness that Helena's Bellatrix has, too; she was beautiful once, but Azkaban has taken its toll. That and all the killing. Bellatrix skipping through the hall, teasingly repeating "I killed Sirius Black!" like a schoolyard chant, is her shining moment in the film. Hmmmm...There are some fascinating moments with Snape in OotP, and not just in that every Snape moment is fascinating. The question of where Snape's loyalties lie have not been raised (remember, I mean in the film series), but every now and again, Rickman's Snape will phrase something a certain way, or an inflection will seem to hint at something else, and we'll think, "Oh, yes, he actually was a Death Eater...and Voldemort is back...and Snape is in the Order...huh..." For example, in his first occlumency lesson with Harry, the way he talks about Voldemort's use of legilimency ("...every last exquisite ounce..."). And those occlumency scenes are captivating - great two-handers for Rickman & Radcliffe. This isn't to do with Rickman, but that brings me to the matter of "Snape's Worst Memory." Placing it there instead of having Harry happen upon Snape's pensieve and dive in was a great idea, the right fit, and if it wasn't that way, the scene would have been cut entirely. That had to mean, though, that you couldn't linger there; why would Snape let Harry see a second more of that memory than he does? Of course, Lily's not there, and I have to go against the Harry Potter fan majority again here in saying that I don't see the problem with that. I don't know if we'll see a version of "Snape's Worst Memory" in Deathly Hallows: Part 2, but assuming we do, that's the point in which we need to know Lily's part in it, and not before. Regardless, when Harry realizes what he's just seen, it's a powerful moment, for Rickman and Radcliffe as actors and Snape as a character. Robert Hardy must have been really pleased when this one came around. Cornelius Fudge is not at a crucial character, but Hardy does actually get to play something here. Fudge is such a frustratingly short-sighted fool, increasingly corrupted by his own stubbornness and need to hold onto things as they are rather than of face the truth. Something about Hardy/Fudge when he says, "I'm sorry to interrupt what I'm sure would have been a very well-rehearsed story," I really hate him in that moment. Nicholas Hooper's score is okay, it really is, and sometimes great actually, but it isn't as memorable or emotionally affecting as we've come to expect. "The Room of Requirement" and "Professor Umbridge" are definitely the highlights, the former an exciting, inspiring theme that for the D.A. that builds wonderfully, and the latter a bombastic, annoyingly repetitive piece that suits its subject to a tee. "Fireworks" is fun as well, and became the de facto Fred & George theme in Half-Blood Prince. "Possession" is emotional enough in the moment, even if it's, again, not too memorable. I feel like the "blue filter" thing has become an infamous criticism of this movie on this site, and sure, occasionally, it looks like it's merely that - "Okay, slap on the blue filter to make it look 'dark'." I think it's unfair to make too much of that, because D.P. Slawomir Idziak makes this film look impressively bleak - I said it about the script, I'll say it about the visuals: This movie's presenting a world on the edge of war, and this isn't a kid's movie trying to seem edgy-dark where it's not, it's a movie with genuinely troubling subject matter and doesn't pull its punches, thematically or visually. -I feel bad for Natalia Tena that she gets so little to do. She's actually more like Tonks as herself than she is when she's playing Tonks inthe films, because that character's even more marginal in the films. I would have rather Tonks been cut than given such short shrift. -I was so bothered by the Order's little flight through London landmarks, because surely they were seen by a smattering of muggles there, but after the chase in Deathly Hallows: Part 1, they're being super-stealthy by comparison. -The shots of the massive crowd in the Ministry atrium is pretty awe-inspiring. -The look of realization on Harry's face, at the end of the detention scene, as he realizes who Umbridge is and what he's dealing with, is one of the greatest things in this film. -I love how the thestrals look: just the right combo of scary and fascinating. -Although I kind of miss Rita Skeeter, making it the breakout of a bunch of Death Eaters that turns Seamus and some others around to believing Harry was the better way to go. -Considering that Ron, Hermione, Neville, and Ginny can't see the thestrals they're riding on, it would have been cool to see glimpses of looks of terror on the faces of some of them. -The possession scene is actually pretty gut-wrenching, so well done. Harry expelling Voldemort from him by saying, "You'll never know love, or friendship, and I feel sorry for you" is something that works really nicely. You run the risk of making your villain less threatening when you make him or her more sympathetic or have another character show some compassion toward them, but it's a risk that's worth taking. Harry's probably not too bothered with pitying Voldemort, but he does feel sorry for him, and we do a little bit too, because if this story is ultimately about anything it's - not to make a Huey Lewis reference here - the power of love. The pace, and the movie's desire to overcompensate and rush certain areas in order to not let things slow too much, hurts Order of the Phoenix, but in mood and characterization, and also a few terrific action sequences, OotP works brilliantly. Last edited by IenjoyAcidPops; August 17th, 2011 at 3:59 am.